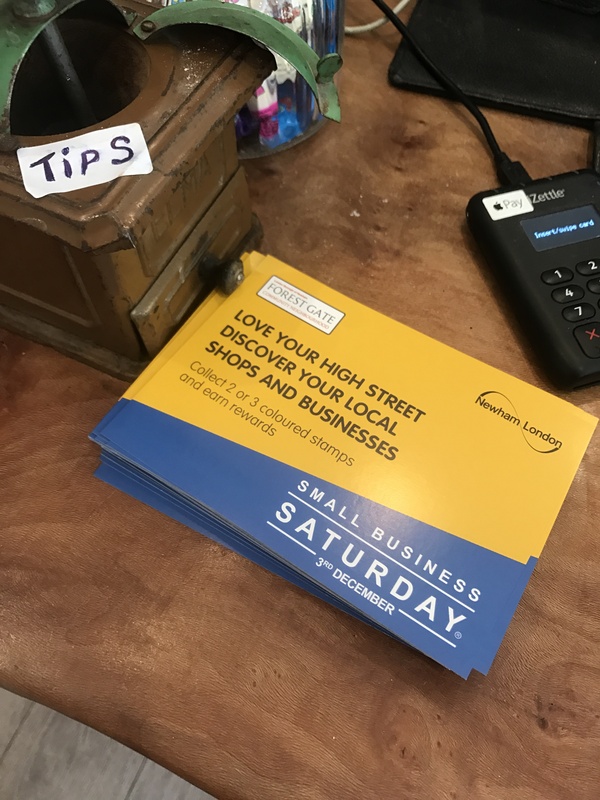 Tomorrow is Small Business Saturday, and is also the switch on of the Forest Gate Christmas lights, and ALSO is Woodgrange market’s night market. So after the success of our mini campaign last year it seemed the perfect chance to do something even better to celebrate the small businesses that make Forest Gate so special. Last year we did our social media campaign on a bit of a shoestring, this year we were fortunate enough to have some money through the Regeneration department at Newham, and planned a project that would encourage people to support local small businesses, and to try out new ones. We are very fortunate in Forest Gate to be benefitting from some Council-led physical regeneration, with the Crossrail station improvements, plus additional improvements planned with ‘LIP’ money from Transport for London, plus the planning enforcement work currently being done around smartening up shop fronts and enforcing by-laws. 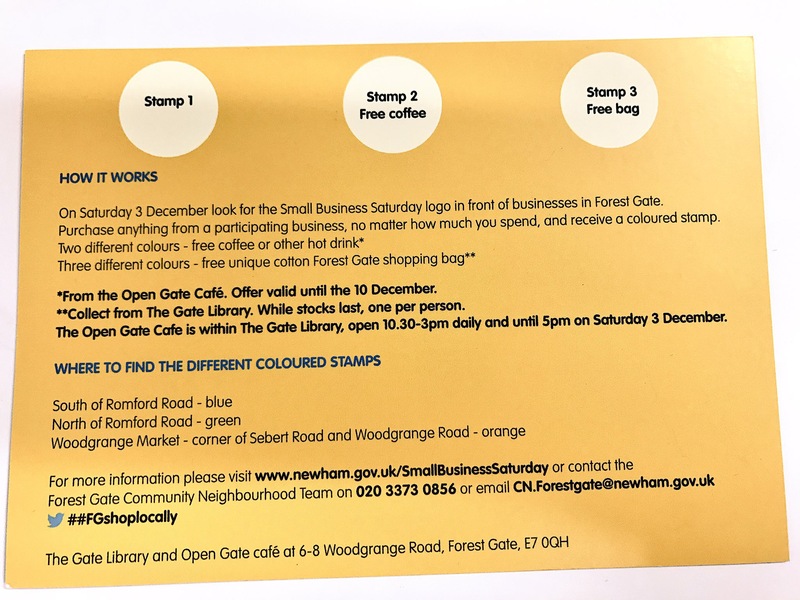 This project is intended to help amplify the effects of this investment and work, to support our small retailers in Forest Gate, and encourage local people to spend money locally not just on December the 3rd, but all year round. #fgshoplocally is the result! Look out for the posters or stickers in participating shops, and pick up a loyalty card. Collect a sticker with each purchase, of whatever value. Collect two stickers of different colours, and get a free coffee from the Gate. 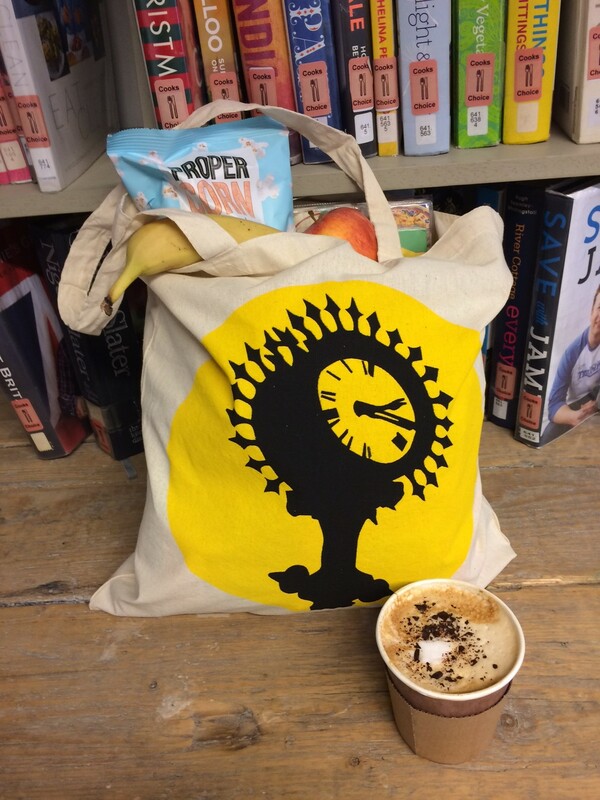 Collect all three different colours and pick up your free canvas shopping bag from the Gate (while stocks last). You can read about it on the Newham website, and also see the full lists of participating shops. The team at the Gate have worked tirelessly, visiting shops and explaining the plan, and giving out the information, and we now have an amazing 90 shops signed up, so are looking forward to a successful day tomorrow. 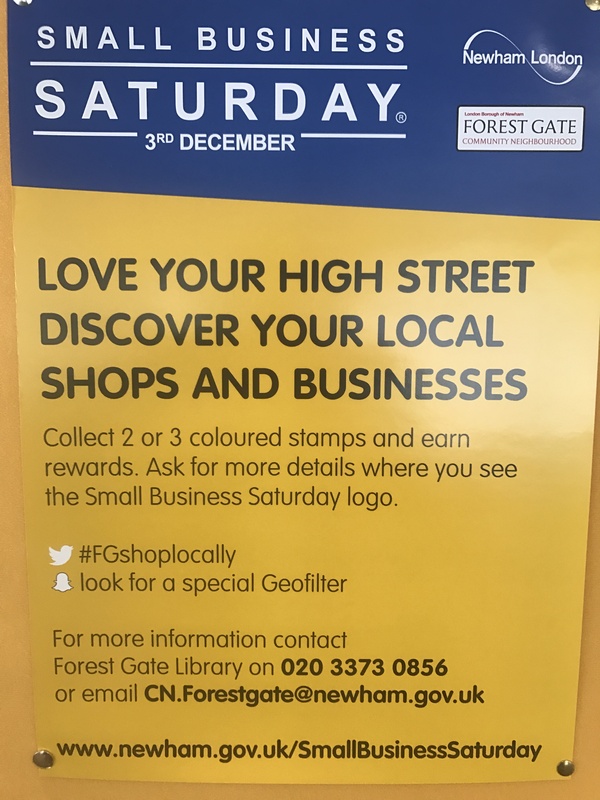 Please do take part, and tweet us pictures of the things you buy, using our hashtag #fgshoplocally. There is also a Snapchat geofilter (thanks to Seyi). Seyi and I will be out and about, with Lyn Brown our MP, visiting shops, and generally tweeting up a storm. Please do join us, and create as much buzz as you can. Pop into the shops you love, and explore those you haven’t been to before. (I live right at the northern end of Forest Gate, and am looking forward to spending some more time in the shops south of the Romford Road.) Share pictures of your bargains and treasures using the hashtag, and get hints and tips about where to visit. Whe you’ve made your purchases and are modelling your bag, come to the market place for the lights switch-on (lights are coming on at 5.30pm, switched on by me, which I am trying to be all nonchalant about, but am now feeling rather childishly excited by). Then stay for the night market, which will have entertainment, and food and drink. There’s even a complementary campaign in Maryland, where you can make any purchase in a Maryland small business, bring your receipt to Nooks, and pick up your free bag. However you spend it, have a wonderful weekend.